“Picturing the Past: Paleoart 2018,” at the The New Mexico Museum of Natural History and Science, opened this past weekend. 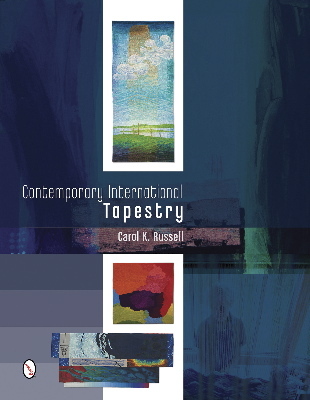 A juried international exhibition in a variety of media, mine is the only tapestry in the exhibit. Other media include: two quilts, colored pencil drawings, acrylic paintings, cut paper and several small sculptures. About half of the 89 artworks are digital prints. A principle criteria for all work in this show is scientific accuracy, within artistic interpretations of our prehistoric past. View of first room, two partial walls. The Veils of Time tapestry beside digital art. I visited this exhibit at the Sneak Preview for the fundraising gala “Cretaceous Couture” fashion show and silent auction. I found myself drawn to the wall of trilobites, and in particular, the cut paper work on the far right. I thought of my father, who would take our family on fossil-hunting expeditions, when I was very young, usually on occasional Sunday afternoons. We lived on the edge of the Flint Hills in the southeast corner of Kansas, where road cuts would reveal geologic strata. We would see a variety of invertebrate forms in the layers of limestone and shale, and if we were lucky, we would find a trilobite. Thus I was introduced to the concept of time being so much larger than the clock face, the hours in a day and my own lifetime. As a child, I could not grasp the largeness of millennia so long ago when these invertebrate creatures were alive. As an adult artist, I keep returning to themes around geologic time in my tapestries, as though the huge number of hours spent at the loom weaving somehow can give me a glimpse into eternity. “Visions of the Past: Paleoart 2108” is up through January 4th, 2018 at the New Mexico Museum of Natural History and Science, located at 1801 Mountain Road, NW in Albuquerque, New Mexico.